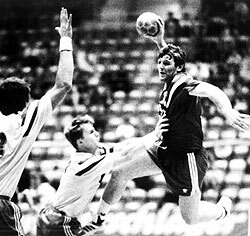 Important chapters of the Champions League history will be missing from top handball for at least a year. Asobal League finished badly for two former Champions League winners, Teka Santander and Bidasoa Irun. Both teams were relegated at the end of the season. Santander is a European handball capital. Dujshebaev, Matts Olsson, Iakimovic, Garralda, Hombrados… They are all world stars who played in La Albericia Pavilium. The glorious time of the club was in the 90s. In 1994, Teka won Champions League as Spanish title holders. Santander had a strong team based on young talents from the former Soviet Union. Dujshebaev, Iakimovic and Nesterov joined some of the best Spanish players (Garralda, Villaldea or Urdiales) and other stars, such as the Swedish goalkeeper, Matts Olsson. The entire city stood behind the team and they celebrated passionately every title won by the team. The new century was less successful for Teka Cantabria that lost important economic support. The quality of the roaster was decreasing as stars left Santander. The culmination of the problems led to Santander relegation 24 years after playing in the Spanish division for the last time. Teka was member of Asobal since 1983. Irun, a small city close to France, saw its heydays under the name ‘Elgorriaga Bidasoa’ also in the 90s. In 1995, they won the Champions League with a very special team. Wenta, Svensson, Perunicic or Gislason were mature players who went to play for top squads after their successes at the club. Twelve seasons later, Svensson and Perunicic still played in the Champions league, while Wenta and Gislason have become successful coaches. In a similar fashion to Teka, Elgorriaga also ended the support of the club. Juancho Villarreal, the mythical coach, left the bench at the beginning of 2000. However, some good players still signed for Irun such as Cazal or Fis. But the goals have changed.